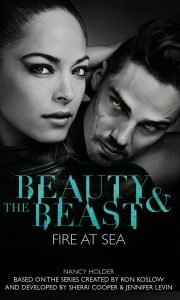 I’m so excited to announce that my third Beauty and the Beast book is out now! I sent Vincent and Catherine on a sea cruise honeymoon. Fire at Sea has a lot of action and smoothies as my favorite couple destroy the Love Boat! I’ve been so proud of all Beasties who have worked so tirelessly to get us a season five on netflix/amazon/hulu SOMEWHERE and I’ve enjoyed meeting my fellow VinCat shippers. Hopefully JT and Tess will walk down the aisle, too! Buy Fire at Sea here on amazon and remember to support your local bookstore whenever possible! This entry was posted on Monday, June 6th, 2016 at 3:15 pm. You can follow any responses to this entry through the RSS 2.0 feed. Both comments and pings are currently closed.